Statistically, senior citizens are one of the happiest demographic groups in the United States. With age comes acceptance of one’s strengths and weaknesses, wisdom and an appreciation that each day is a gift not to be taken for granted. Gone are the days of competition, comparison and stress. Time opens up to allow more space for friends and family and diversions set aside earlier in life. In fact, some studies support this rather rosy view of old age. University of Chicago researcher Yang Yang found that the probability a person would report being “very happy” increased 5 percent with every ten years over a person’s entire adult life. Yang observed that race, income and gender also played a role in happiness — however, the differences attributable to these factors narrowed as the person grew older. In 2006, researchers at the Sanford School of Public Policy at Duke University discovered a U-shaped happiness curve: self-reported happiness is high in youth, bottoming out in middle age, then rising during old age. These scientists surmised that one factor contributing to happiness in old age is the ability of older persons to enjoy the present. They strive less, they appreciate more. (These same scientists acknowledged that their survey data may be biased because, for various reasons, happy people tend to live longer). Standing against this data is the reality that, for many, old age sets unyielding obstacles on the path to happiness. Many struggle with isolation and cognitive decline. Approximately 65 percent of seniors have at least two chronic health conditions. Less than 20 percent have received guidance on how to develop a plan for managing their health. And, among low-income senior citizens, 74 percent say that lack of money or energy creates a barrier to managing their health care needs, all according to the 2015 United States of Aging Survey. Maintain or improve physical fitness. Engage in activities that keep mental faculties sharp. Physical health is an important determinant of happiness. It is hard to be happy while enduring stiff joints or copying with chronic illness. Physical health is a blind spot for many senior citizens because, according to surveys, seniors tend to over-estimate the state of their health and the amount of exercise they are truly getting each week. According to the most recent data from 2017 from the Centers for Disease Control and Prevention, 22 percent of non-institutionalized persons age 65 and older are in fair or poor health. Forty percent of age 65-74 are obese; among women age 65-74, 43 percent are obese. Obesity has been linked to increased risk of a myriad of serious health conditions: high blood pressure, diabetes, heart disease, joint problems, sleep apnea and cancer. Seniors should do everything possible to remain healthy as they age. The CDC recommends that seniors engage in five hours of moderate-intensity aerobic exercise, plus two muscle-strengthening exercises, each week. The Alzheimer’s Association reports that seniors fear dementia more than death. Moreover, according to a 2011 survey by the MetLife Foundation, the only disease seniors dreaded more than Alzheimer’s Disease was cancer. And a 2017 study by the Alzheimer’s Association found that Alzheimer’s or dementia is more feared than death. Many seniors believe that there is nothing to be done to prevent cognitive decline. This belief appears to be unfounded. The latest scientific evidence suggests a number of lifestyle measures seniors can adopt to delay or prevent cognitive degeneration as they age. Seniors should challenge themselves to learn new things. Puzzles, music, art, even gardening all stimulate the brain and provide a defense against cognitive decline. A study conducted by the Rush Memory and Aging Project suggested that actively learning, mental engaged seniors were 2.6 times less likely to develop Alzheimer’s Disease and dementia than less cognitively active seniors. A September 2018 study commissioned by the AARP Foundation discovered that approximately one-third of adults age 45 and above report feeling lonely — a condition that has been linked to health and financial problems. The AARP says that social isolation contributes to an estimated $6.7 billion in additional Medicare spending each year. The flip side of the isolation coin is connectedness. Seniors report a strong correlation between happiness and close family ties. Data collected in the 2015 United States of Aging Survey revealed that being close to family members was the most important happiness factor among senior citizens. Proximity to family was listed as important in 53 percent of survey responses. 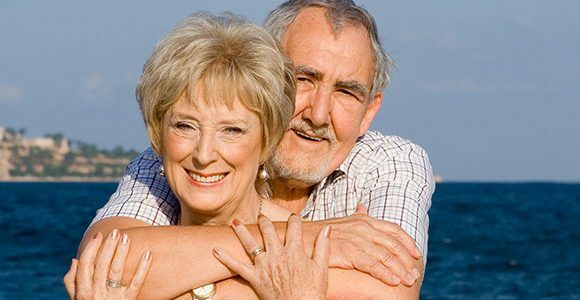 The latest research from the Harvard Study on Adult Development indicates that close inter-personal relationships sustain happiness throughout a person’s life and also help to delay the mental and physical decline that come with age. Along similar lines, a 2011 Gallup poll found that they more time seniors spend with friends and family the more likely they are to report being happy and stress-free. 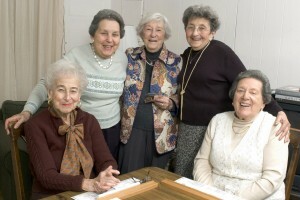 In addition to family connections, social activities keep seniors engaged and happy. Experts advise seniors to join a club related to their favorite hobby, volunteer in the community, check out local adult education centers, join a fitness center (some cater specifically to seniors), and reach out to family members. Seniors should be sure to investigate social media and other emerging communications tools. Increasingly, technology is providing seniors with powerful means to make connections, keep up with the local news and pursue interests shared like-minded seniors in their community. Seniors who are able to set goals and find meaning in their day-to-day lives appear to have a substantially reduced risk of Alzheimer’s Disease and a less rapid rate of cognitive decline as they age. Researchers writing in the Journal of the American Medical Association in 2010 studied 900 seniors and found that having a greater purpose in life correlated to a reduced risk of Alzheimer’s Disease and a less rapid rate of cognitive decline in persons without Alzheimer’s Disease. 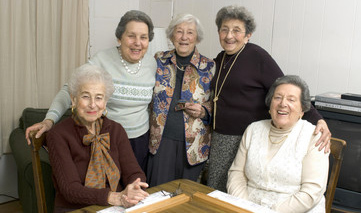 Purposefulness in life can be achieved in both large and small ways: physical activity, social clubs, religious pursuits, volunteering in the community, travel and providing support for other family members all can foster a meaningful sense of purpose in life among seniors. Regular work outside the home is a good way to keep the mind stimulated and engaged. Seniors benefit from conversation with others, purposeful activities, and a routine that gets them out of the house and involved in the community. Physical fitness is not the only reason to exercise. Medical researchers are also discovering a link between poor nutrition and cognitive decline. There appears to be a strong connection between a nutrient-dense diet and strong thinking skills. Lack of exercise and cognitive decline also appear to have a statistical relationship. According to a recent study published by the Journal of Alzheimer’s Disease, regular physical exercise may slow cognitive decline in older adults. Seniors should get at least seven hours of sleep each night. A 2018 study conducted by the University of Texas found a correlation between poor sleep patterns (lack of sleep, sleep apnea) and cognitive impairment among older adults. It is also important to have a regular sleep schedule, retiring and waking at the same times each night and day. Happiness in old age appears to be a choice rather than a circumstance. From all available evidence, senior citizens who foster close ties to friends and family, and have plans in place for both physical and mental fitness are the most likely people to enjoy a long-lasting and fulfilling retirement.